Inspiration is the best gift one can get or give. To get inspiration is hard and to get inspiration from the right person at the right time can take a way long ahead. Inspiration was a new word to me when I was lost in my own strings of world. People said that to be successful in life I would have to get inspired to do things which other successful people have done...!!! But what I wondered was - From where did they get inspired? At some or the other point even they would have got inspired by other successful people. This answer runs the same question in my mind again of who were they inspired of...?? 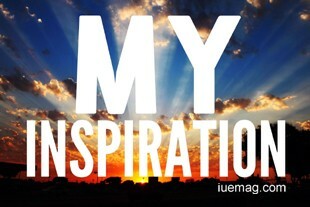 My Inspiration is a great one; more than my inspiration it has become my best friend through my steps of life. We believe that it’s hard to find a best friend, but I believe that unless we try to find one we don't get one. Nothing in the world is easy to get and once we get the right inspiration which pushes us through our way to a bright future we ourselves can’t predict what we are capable of. The inspiration which I got is valueless. I would like to call it the best thing of my life which taught me how to accept ‘No’, how to explore myself, how capable I'm to do better in my life and get out of my comfort zone and take a different path or create my own path rather than following the old path. It taught me that there are a lot of things in life to do and to do new things in life you should have a great vision which not only helps you grow but also helps others grow. You have to share your knowledge to be wise; you always have to be a learner to be knowledgeable to inspire others. I also learnt that to do something new in life you need not know everything. It is just that you get to know that if you are capable of doing anything at all then just go ahead and do it and take action on it. Don’t just sit there and think about your capability to do it. You never know what you can get through to tell the world. Alike today, I shared a part of my inspiration. You, out there reading may get a little inspired to do a new thing in life, but to do it you really need to be inspired. So, get up and find one. Who knows you may have it to your close...!!! Any facts, figures or references stated here are made by the author & don't reflect the endorsement of iU at all times unless otherwise drafted by official staff at iU. This article was first published here on 30th December 2014. Chandana Mala C L is a contributing writer at Inspiration Unlimited eMagazine.